Fiona on Grandma's Old Ratty Blanket, ink & watercolor, 6x4"
Fiona loves curling up in this funky old wool blanket. It was my grandmothers so despite it being in tatters I can’t part with it and use it as a throw on cold evenings. There is a corner missing that my sister’s rat munched off years ago, and another corner missing that I cut off and sent to an Australian artist friend, Allison Horridge, who was collecting fabrics for an art project. I will be offline this week to focus on the Alla Prima Portraiture workshop with Rose Frantzen that I was so incredibly lucky to get into from her waiting list. She only teaches a couple of times a year; registration for her June class will be by lottery. 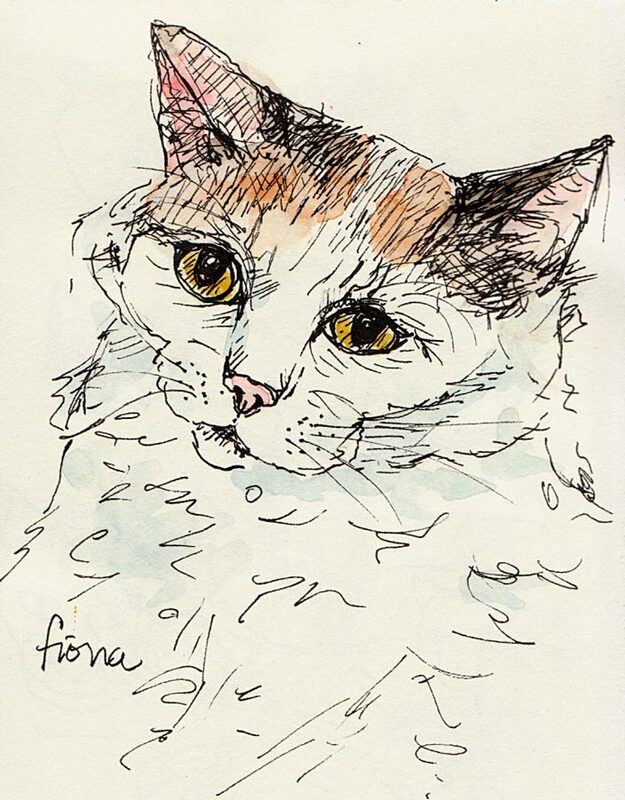 Fiona, ink & watercolor, 6x4"
Meanwhile, I have the best pet sitter: Rachel McGraw of McGraw’s Paws. She is so professional, honest, kind, organized and caring. I wish all business owners could take a lesson from her. It’s weird having to show house-sitters and pet-sitters my other (neurotic) cat Busby’s hiding places: my closet behind the shoes, the bottom shelf of my dresser, kitchen cabinets (including the one above the fridge), under the couch and bed, or behind a painting drying rack. 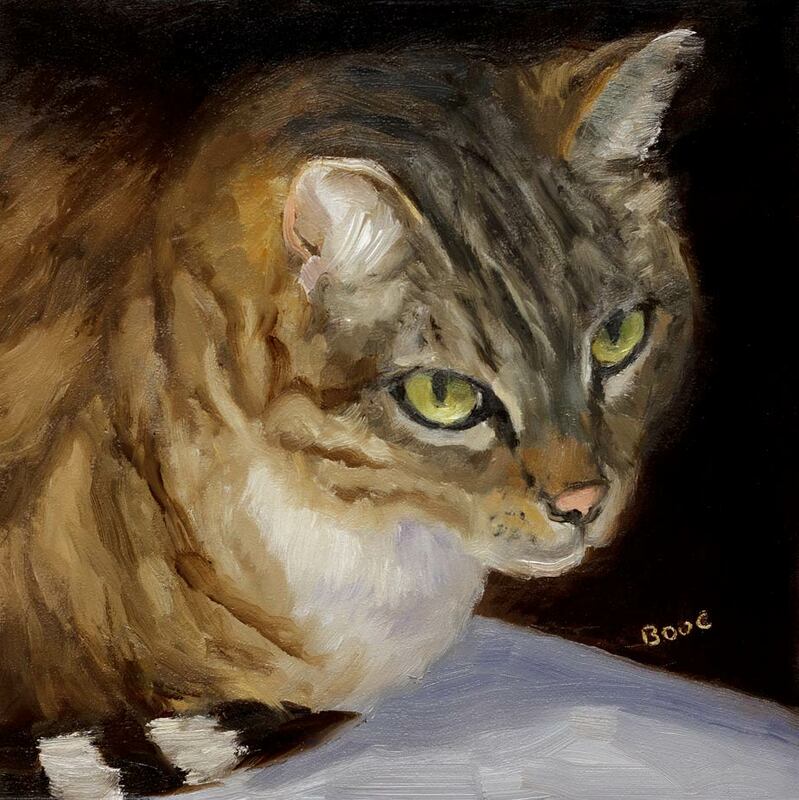 Busby Berkeley: The Cat, Oil on Panel, 6x6"
Fiona likes everyone, and even Busby (above) who is scared of everyone likes Rachel. Enjoy your class! Love the cat sketches and painting! Really lovely cat paintings-especially the oil one.Have a great time at your workshop. It will be fun to see what you do. I’ve seen the video about Rose and her portrait project, and she is incredibly talented and seems really down to earth and friendly too. I know you’ll get so much out of this, and you’ll have to share about it, as those of us who are fans (both of hers and yours) will be waiting to hear about your adventure. Be a sponge! I can’t wait to see what you learn from this workshop!! Have a great time!!! Have a fabulous time on the course. Love these kitty pics. 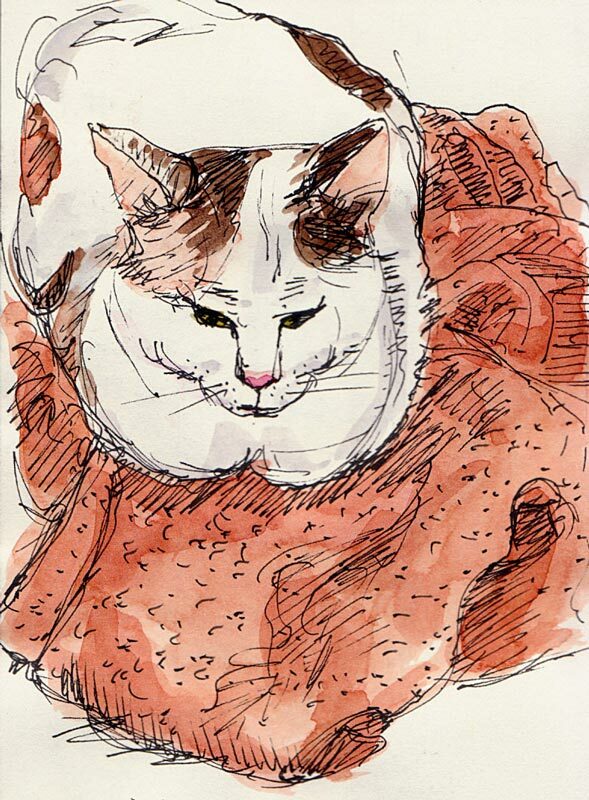 Hi I really enjoy your online journal – your pen an ink sketches especially of your kitties makes me smile. Keep sketching!